Prior versions: Jan 2015, June 2013, May 2013. The learning guide “Discovering the Art of Mathematics: Number Theory” lets you, the explorer, investigate the intricate patterns and relationships that challenge our understanding of the system of whole numbers. Familiar since childhood, the whole numbers continue to hold some of the deepest mysteries in mathematics. Exploring the golden ratio and Fibonacci numbers helps you bridge mathematics to art, architecture, music and nature. Moving in cycles introduces congruences, where you find applications to cryptography and the search to understand the distribution of the prime numbers. Partitioning whole numbers brings you to some of history’s most important mathematical problems as well as areas of intense contemporary research in mathematics, including: the twin prime conjecture, Goldbach’s conjecture, partition congruences, Waring’s problem, and Fermat’s last theorem. 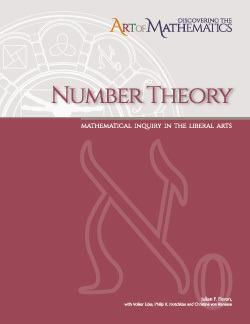 "Discovering the Art of Number Theory is delightful... When I was teaching an MLA courses here at Penn State... I never found a text that was close to what I needed. Prof. Fleron's text fits the bill."